Otto, Lucia, and Max Hardscrabble live in a small town with their Dad, Casper. Mom disappeared years ago. Lucia thinks she's dead because the alternative, that she left, is just too hard to fathom. Lucia takes care of Otto "an avid collecter of the strange and unusual" who stopped talking soon after their mom left and has a reputation for being strange and unusual himself. The youngest, Max, is a genius and he makes sure everyone knows it! Their Dad is always on the go, painting the portraits of deposed royals. Each sketch he brings home is an opportunity for the Hardscrabbles to make memories as they gather around to hear the story of the pushed out king or queen. In the Kneebone Boy, Casper has to go away suddenly and sends the Hardscrabbles to stay with their cousin Angela. When they arrive in London they find that Angela is gone! They use this mix up to embark on an adventure that ends with them running for their lives! They finally get to Snoring-On-The-Sea and start to search for their great aunt Haddie. And that's when the real adventure begins! 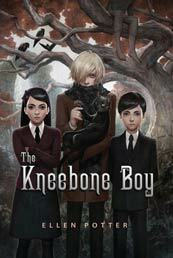 The Kneebone Boy has this wonderful, dark humor combined with a great mystery. Or many great mysteries! The voice is snarky but fun and the Hardscrabble's word choice demonstrate Ellen Potter's belief in the intelligent reader. "I honestly think kids are getting stupider by the year." This story proves that she really doesn't feel that way. The chapter subtitles are like little stories themselves "In which" Potter gives a tiny glimpse into the future or at least the chapter. The characters were just that, characters. Great Aunt Haddie sounds like the relative we all want to go visit, an adult that doesn't try to be your friend by making jokes and being corny but becomes your friend for that very reason. And just when you think you can't possibly keep snickering aloud, Potter throws in something that makes you sigh and possibly tear-up. I must say, If I didn't know Ellen Potter wrote SLOB, I wouldn't believe the books had the same author. The tone and voice were so different....although both stories do have missing moms... I give this 4 copies. It's a must read! I really loved it! Give it to the students in 6th who need a challenge and one's who like their mysteries smart. I'll put it right next to The Death (and Further Adventures) of Silas Winterbottom by Stephen Giles. Thanks to Feiwel and Friends for this ARC. Wow, that's sounds awesome. I love the cover.